Part of that experience was the reminder that our world holds people who don’t know where their next meal is coming from, or if they’ll have a dry place to sleep that night. That there are children who are abused, animals who are tortured, nations being oppressed, even eco-systems being destroyed. That so much is wrong. That so much needs fixing. Is it odd to say that was heartening? Because it was so inspiring to be around hundreds of people who have given their time and energy and so much more to help others. The principle is simple. The lower on the pyramid, the more important the need. Until that need is filled, the person will not focus on the needs above it. The person with physiological needs like food, sleep, and shelter cannot focus on the needs other than that until those needs are met. Self-actualization needs, like education, creativity, and spirituality, cannot be addressed until all other psychological and basic needs are met. These are generalizations, obviously. Am I saying that hungry people can’t think about self-actualization? No, but the overall trend — to which there will always be exceptions — is that they don’t. 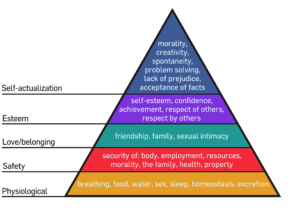 I suspect that the further up the pyramid you are, the more exceptions occur. Here’s an important thing when you’re thinking about that pyramid and America. In a recent study by the Federal Reserve Board, 47% – close to half — of the respondents said that if an emergency arose requiring them to get $400, they would have to borrow the money or sell something in order to come up with it. That means that almost half of the people responding — which would be a group that probably didn’t include children (who represent a significant chunk of the homeless population) — had less than $400 tucked away in case of the proverbial rainy day. Which could take the form of a medical emergency. Or a car repair. An unexpected hike in tuition, rent, or even groceries. Do not pass Go; do not collect $200. There is often an idealism about the Left that is admirable, that is stirring, and that sometimes, unfortunately, clashes with pragmatism and does not emerge the victor. 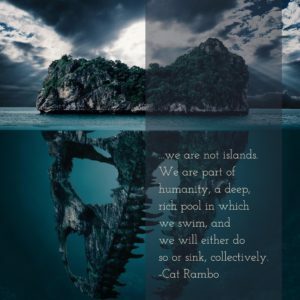 I personally believe human beings are primarily good — but I also know everyone’s flawed, everyone’s got a whiney and entitled inner child, and that sometimes we let that inner child steer the boat when we shouldn’t. And that inner child is more in connection with the needs Maslow talks about than one might like to acknowledge. Here is a fact that holds true in a complex world, at least in my experience. Social justice falls on different places in the hierarchy depending on an individual’s circumstances. Are you a person who has to worry that if you are stopped by American police you may be shot? Then the Black Lives Matter movement is placed differently for you than for your white friend. You may both support it, but that context is different for the person that actually has to worry about a bullet. Privilege exists, and this is part of privilege. One’s personal privilege affects how the world treats you. That privilege can take many forms: skin color, inherited wealth, education, how a legal system views and treats your physical body, and on and on. Sometimes (often) our own privilege is invisible to us; we do not perceive it because it is the very definition of “normal” for us, how the world is. That last one is important because many folks leave it at that, divide everything into normal and not normal. That’s a very easy way of thinking, one that lets us leave it all up to our base instincts, the monkey brain that governs us much more than we’d like to think. The same one whose first instinct with the strange is to throw feces at it. I’m practicing the principles of peacetalk. Choosing my communication goals, paying attention, rejecting preconceptions, staying in tone, not taking bait, helping the other participants maintain face, choosing my metaphors with care, trusting my inner grammar, telling the truth, and above all practicing the skill of skills, joy. I’m continuing with the volunteer work I do and trying to be a good leader for SFWA at a time when a lot of members are very worried, particularly about their health care. Offering Plunkett scholarships for my classes so I can encourage writers who might not otherwise be able to take them. And maintaining the small practices, like shipping books off to the Women’s Prison Book Project, steering my shopping through the Amazon Smile Program, supporting HumbleBundle and StoryBundle (admittedly, buying books is not really a huge sacrifice), donating to local homeless shelters and food banks, and making charitable contributions for Christmas presents and to memorialize the loved ones lost this year. I’m practicing gratitude harder than I ever have before. Letting the people around me know how valued and loved they are. Waking up each morning and thinking of someone that I find marvelous about this world, whether it’s marshmallows or goldfish or my friends or that book I read yesterday. Celebrating the tiny victories, like the fact that my Christmas cactus is blooming, and it is beautiful and bright despite the seasonal gloom here in Seattle. I’m not giving in to despair and apathy. Neither should you. This entry was posted in daily life and tagged #sfwapro, abraham maslow, doing good works, gratitude, leadership, maslow's hierarchy of needs, nattering social justice cook, nonprofit leadership, peacetalk, social justice, suzette haden elgin, volunteer work. Bookmark the permalink. So much. They matter more now than ever.